Introduce a chocolate lover to the exotic flavors of fine cacao from around the globe. Please specify milk or dark chocolate. 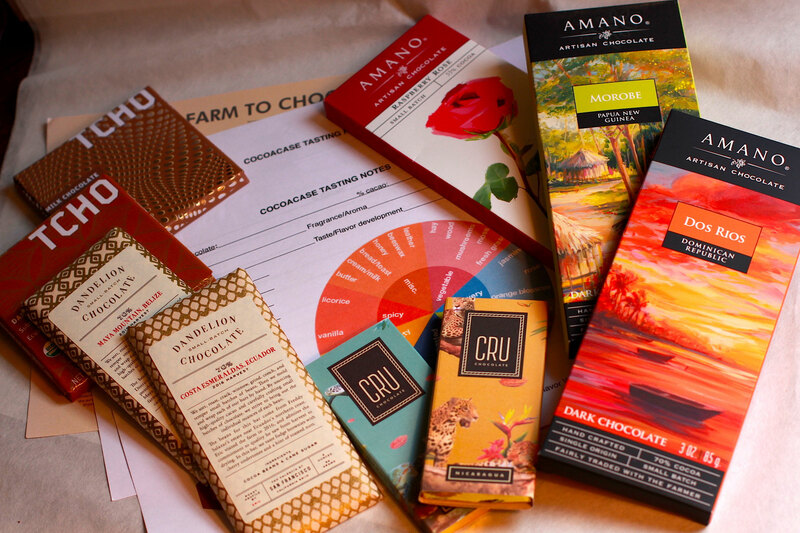 One time delivery includes 2 curated, premium artisanal chocolate bars to savor and compare, a tasting guide to track their favorites, information about the chocolate, its origins, and the chocolate makers. Wine pairing suggestions are included to highlight the flavors of the cacao. Enjoy the flavor of hot chocolate with the earthiness and low calorie benefits of tea. Made from the husks of cacao seeds, this tea is a rich source of mood enhancing and stimulating theobromine, the "feel good" chemical in chocolate. Package contains 4 oz. of loose leaf tea, created by Manoa Chocolate on Oahu. Directions: brew 1-3 tsp. per serving in a infuser, coffee maker, or french press; add sweetener and milk as desired. Limited quantities. Host your own tasting party! This kit of fine chocolates includes excellent milk chocolates and dark chocolates from around the globe highlighting the unique flavor experiences that are distinct from country to country. Your guests will indulge in and enjoy the best craft cacao available while learning how to best taste and enjoy all kinds of chocolate! The case includes 9 curated, artisanal chocolate bars for you and your fellow chocolate lovers to savor and compare. Also included is a step-by-step guide to setting up a fun tasting party, along with tasting guides to track your favorites, and information about each chocolate -- its origins and the chocolate makers. Wine pairing suggestions included with the kit can really highlight the flavors of the cacao. Fun for book groups, Mom's groups, wedding showers and for gatherings of your chocolate-loving family and friends! Introduce a chocolate lover to the exotic flavors of fine cacao from around the globe. This kit has both milk and dark chocolate included. One time delivery includes 4 curated, artisanal chocolate bars to savor and compare, a tasting guide to track their favorites, information about the chocolate, its origins, and the chocolate makers. Wine pairing suggestions are included to highlight the flavors of the cacao. Experience the dark chocolate nuances found in these bars from countries around the world. This kit has only dark chocolate (over 50% cacao) included. Note we can only ship within the United States due to the fragile nature of our product. Images of kits above are examples, actual product may vary. For local pick-up orders, please use the "Free shipping for large orders."